I stared at the sun all day and didn't see anything. Still can't for that matter. MACS J0416 is located about 4.3 billion light-years from Earth, in the constellation of Eridanus. This image of the cluster combines data from three different telescopes: the NASA/ESA Hubble Space Telescope https://www.nasa.gov/mission_pages/hubble/main/index.html (showing the galaxies and stars), the NASA Chandra X-ray Observatory http://chandra.si.edu/ (diffuse emission in blue), and the NRAO Jansky Very Large Array http://www.vla.nrao.edu/ (diffuse emission in pink). Each telescope shows a different element of the cluster, allowing astronomers to study MACS J0416 in detail. 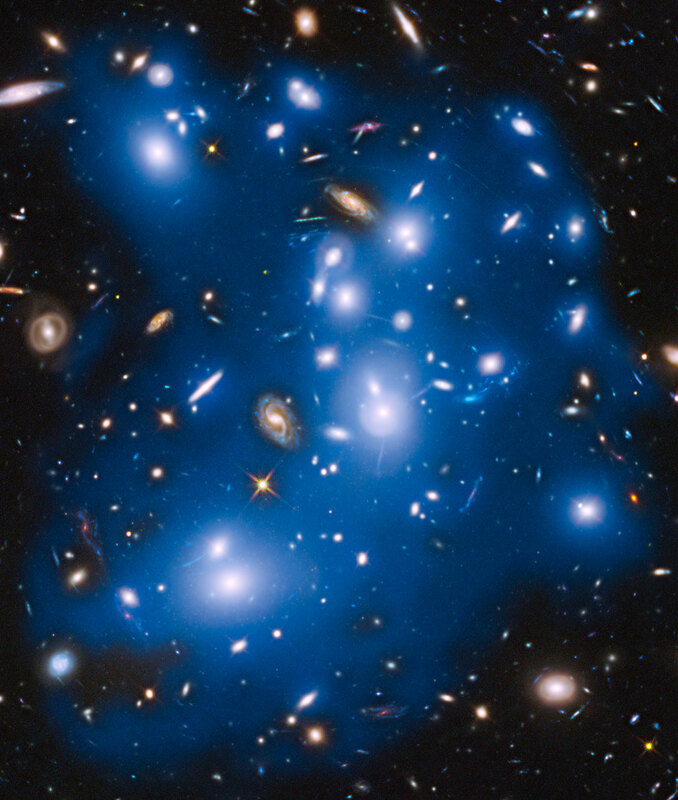 Together with five other galaxy clusters, MACS J0416 is playing a leading role in the Hubble Frontier Fields program http://frontierfields.org/, for which this data was obtained. Owing to its huge mass, the cluster is in fact bending the light of background objects, acting as a magnifying lens. Astronomers can use this phenomenon to find galaxies that existed only hundreds of million years after the big bang. For more information on both Frontier Fields and the phenomenon of gravitational lensing, see Hubblecast 90: The final frontier https://www.spacetelescope.org/videos/hubblecast90a/. Peering deep into the early universe, this picturesque parallel field observation http://frontierfields.org/2014/01/10/cluster-and-parallel-fields-two-for-the-price-of-one-2/ from the NASA/ESA Hubble Space Telescope reveals thousands of colorful galaxies swimming in the inky blackness of space. A few foreground stars from our own galaxy, the Milky Way, are also visible. The massive galaxy cluster Abell 2744, nicknamed Pandora's Cluster, takes on a ghostly look in this NASA/ESA Hubble Space Telescope view. In this image the total starlight from the cluster has been artificially coloured blue. This reveals that not all the starlight is contained within the cities of stars — the galaxies — which appear as bright blue-white blobs. A fraction of the starlight is also dispersed throughout the cluster, as seen in the darker blue regions. This light comes from dead galaxies. The galaxies were torn apart long ago by the cluster's gravitational forces, and their stars were scattered into what is known as intracluster space — the space between the galaxies. These orphaned stars roam the cluster, without being gravitationally tethered to any single galaxy. Because these extremely faint stars are brightest at near-infrared wavelengths of light, this type of observation could only be accomplished with Hubble’s infrared sensitivity to extraordinarily dim light. The galaxies that are not coloured blue are either in the foreground or background and are not part of the cluster. , otherwise known as Pandora’s Box. 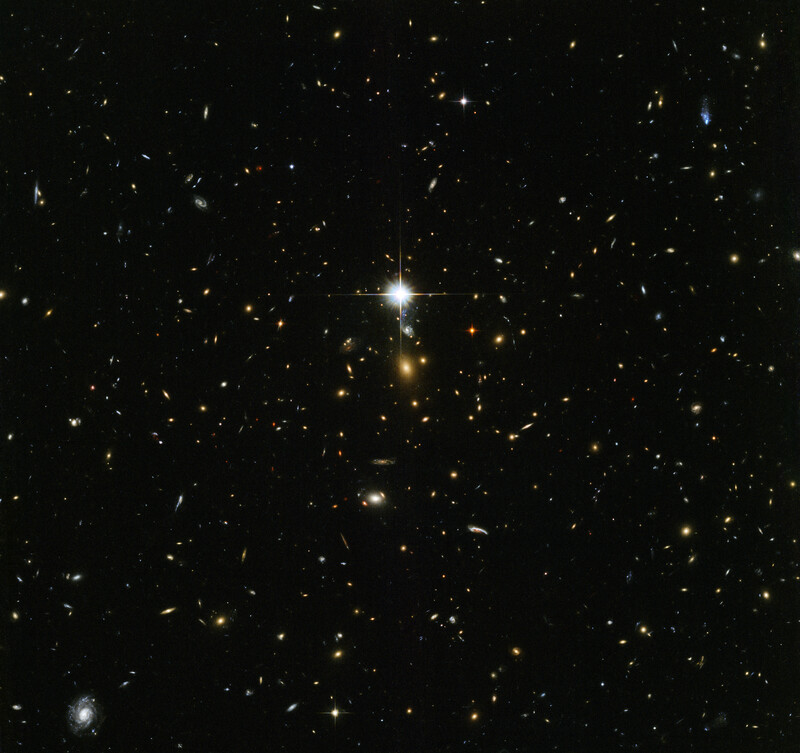 While one of Hubble’s cameras concentrated on Abell 2744, the other camera viewed this adjacent patch of sky near to the cluster. Containing countless galaxies of various ages, shapes and sizes, this parallel field observation is nearly as deep as the Hubble Ultra-Deep Field http://www.spacetelescope.org/science/deep_fields/. In addition to showcasing the stunning beauty of the deep universe in incredible detail, this parallel field — when compared to other deep fields — will help astronomers understand how similar the universe looks in different directions. In this cosmic snapshot, the spectacularly symmetrical wings of Hen 2-437 show up in a magnificent icy blue hue. Hen 2-437 is a planetary nebula, one of around 3,000 such objects known to reside within the Milky Way. Located within the faint northern constellation of Vulpecula (The Fox), Hen 2-437 was first identified in 1946 by Rudolph Minkowski, who later also discovered the famous and equally beautiful M2-9 (otherwise known as the Twin Jet Nebula http://www.spacetelescope.org/news/heic1518/). Hen 2-437 was added to a catalog of planetary nebula over two decades later by astronomer and NASA astronaut Karl Gordon Henize. Expedition 47 Flight Engineer Jeff Williams of NASA captured a series of photos on April 25, 2016, for this composite image of the setting sun reflected by the ocean. This artist’s concept shows an unusual celestial object called CX330 was first detected as a source of X-ray light in 2009 by NASA’s Chandra X-Ray Observatory while it was surveying the bulge in the central region of the Milky Way. A 2016 study in the Monthly Notices of the Royal Astronomical Society found that CX330 is the most isolated young star that has been discovered. Researchers compared NASA’s Wide-field Infrared Survey Explorer (WISE) data from 2010 with NASA’s Spitzer Space Telescope data from 2007 to come to this conclusion. CX330 is not near any star-forming region. As of the most recent observation, which was August 2015, this object was outbursting, meaning it was launching “jets” of material that slam into the gas and dust around it. Astronomers plan to continue studying the object, including with future telescopes that could view CX330 in other wavelengths of light. Seems Expedition 48 Commander Jeff Williams is taking shots of National Parks during his tenure in low earth orbit. Here's a collage of the Grand Canyon. Perspective, perspective, perspective. 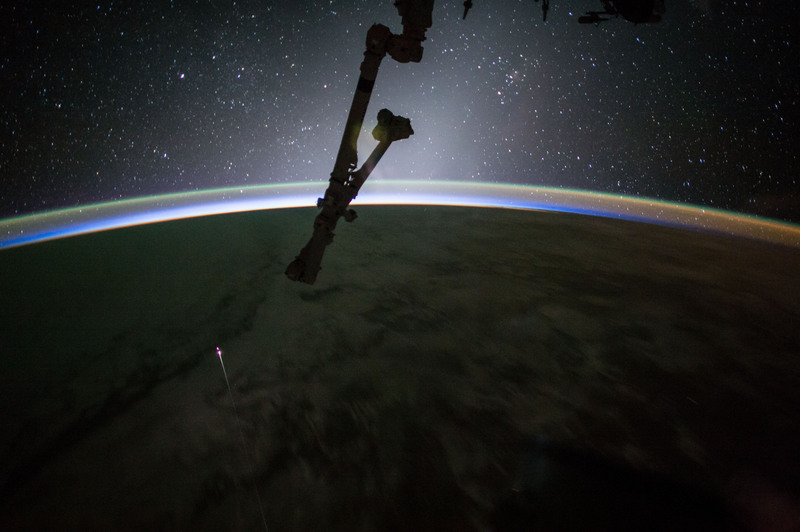 To celebrate the centennial of the U.S National Park Service, Expedition 48 Commander Jeff Williams of NASA has taken hundreds of images of national parks http://www.nasa.gov/content/space-station-view-of-us-national-parks from his vantage point in low Earth orbit, aboard the International Space Station. Here, a series of Williams' photographs are assembled into this composite image of the Grand Canyon. Sharing with his social media followers, Williams wrote, "The mighty @grandcanyonnps adorns the Arizona desert. #FindYourPark #NPS100." Williams also posted a video panorama of the park https://twitter.com/Astro_Jeff/status/768491762079838208 created from images taken on the orbiting laboratory: "Grand indeed @grandcanyonnps. 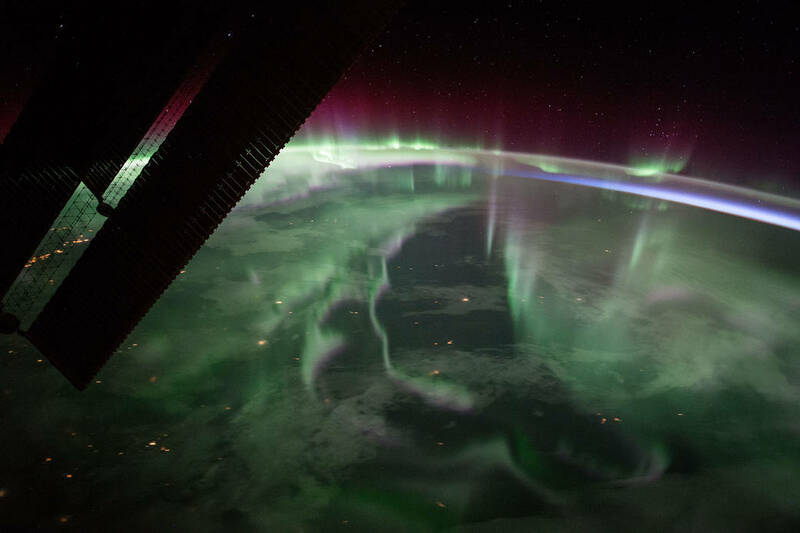 Even from space it took 13 pictures to capture all 277 miles." Take a moment to gaze upon the haunting photo below, which SpaceX published to its Flickr account on Wednesday. It shows the lower half of the Falcon 9 rocket, also called a booster or first stage, moments before sticking a perfect landing on the (comically named) "Just Read the Instructions" droneship in the Pacific Ocean. Mimas' gigantic crater Herschel lies near the moon's limb in this Cassini view. A big enough impact could potentially break up a moon. Luckily for Mimas, whatever created Herschel was not quite big enough to cause that level of disruption. When large impacts happen, they deliver tremendous amounts of energy -- sometimes enough to cause global destruction. Even impacts that are not catastrophic can leave enormous, near-permanent scars on bodies like Mimas (246 miles or 396 kilometers across). This view looks toward the anti-Saturn hemisphere of Mimas. North on Mimas is up and rotated 32 degrees to the left. The image was taken in visible light with the Cassini spacecraft narrow-angle camera on Nov. 19, 2016. 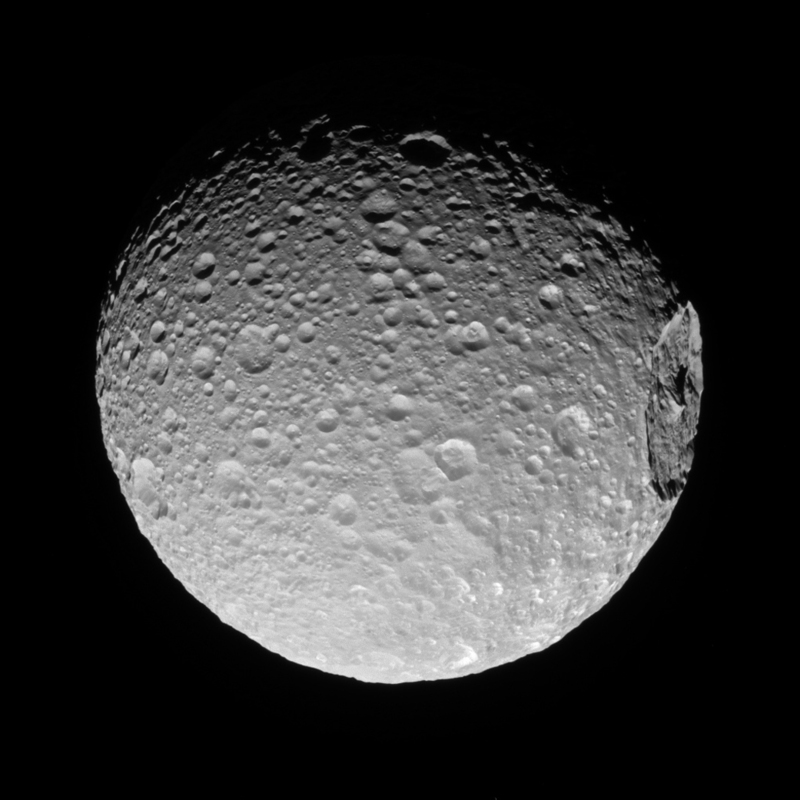 The view was acquired at a distance of approximately 53,000 miles (85,000 kilometers) from Mimas. Image scale is 1,677 feet (511 meters) per pixel. A variety of technological and biological studies conducted on the International Space Station are returning in Dragon. The Fruit Fly Lab-02 https://www.nasa.gov/mission_pages/station/research/experiments/1919.html experiment seeks to better understand the effects of prolonged exposure to microgravity on the heart. Samples from the Systemic Therapy of NELL-1 https://www.nasa.gov/mission_pages/station/research/experiments/2283.html for osteoporosis will return as part of an investigation using rodents as models to test a new drug that can both rebuild bone and block further bone loss, improving crew health. The Cardiac Stem Cells https://www.nasa.gov/mission_pages/station/research/experiments/2436.html experiment investigated how microgravity affects stem cells and the factors that govern stem cell activity. The Dragon spacecraft launched June 3 on a SpaceX Falcon 9 rocket from historic Launch Complex 39A at NASA’s Kennedy Space Center in Florida, and arrived at the station June 5. See what happens when the sun hiccups? IronDog wrote: See what happens when the sun hiccups? Speaking of that, the aurora borealis was visible even in Virginia after that sun burp. Forest, VA is just down the road a couple miles from where I live. I didn't personally see the lights though. I had to borrow Kress's squirrel ladder to get this shot, but it was worth it. This striking image of Jupiter was captured by NASA’s Juno spacecraft as it performed its eighth flyby of the gas giant planet. The image was taken on Sept. 1, 2017 at 2:58 p.m. PDT (5:58 p.m. EDT). At the time the image was taken, the spacecraft was 4,707 miles (7,576 kilometers) from the tops of the clouds of the planet at a latitude of about -17.4 degrees. 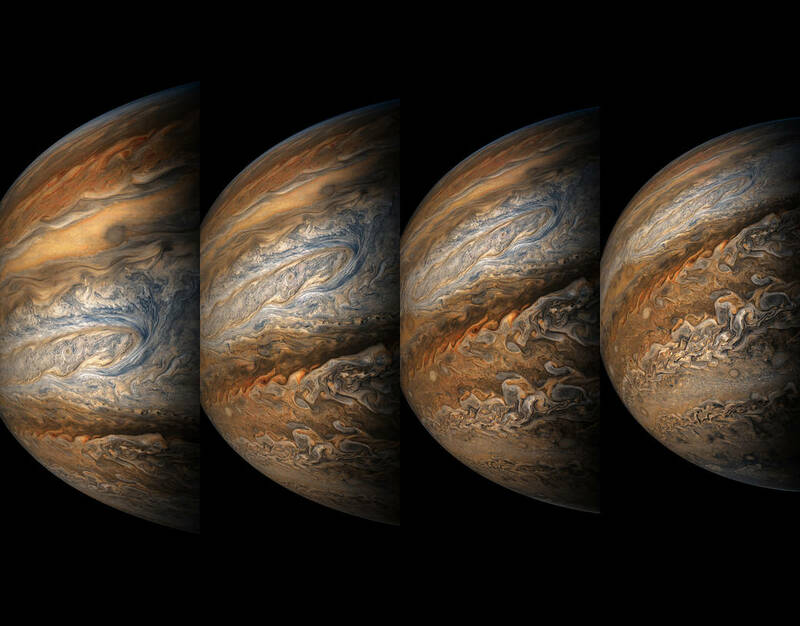 This series of enhanced-color images shows Jupiter up close and personal, as NASA’s Juno spacecraft performed its eighth flyby of the gas giant planet. The images were obtained by JunoCam. From left to right, the sequence of images taken on Sept. 1, 2017 from 3:03 p.m. to 3:11 p.m. PDT (6:03 p.m. to 6:11 p.m. EDT). At the times the images were taken, the spacecraft ranged from 7,545 to 14,234 miles (12,143 to 22,908 kilometers) from the tops of the clouds of the planet at a latitude range of -28.5406 to -44.4912 degrees. Points of Interest include "Dalmatian Zone(https://www.missionjuno.swri.edu/junocam/discussion?POI=1206)/Eye of Odin(https://www.missionjuno.swri.edu/junocam/discussion?POI=1175)," "Dark Eye(https://www.missionjuno.swri.edu/junocam/discussion?POI=1249)/STB Ghost East End(https://www.missionjuno.swri.edu/junocam/discussion?POI=1246)," "Coolest Place on Jupiter(https://www.missionjuno.swri.edu/junocam/discussion?POI=1200)," and "Renslow(https://www.missionjuno.swri.edu/junocam/discussion?POI=1192)/Hurricane Rachel(https://www.missionjuno.swri.edu/junocam/discussion?POI=1227)." The final image in the series on the right shows Jupiter’s south pole coming into view. NASA’s asteroid sample return spacecraft successfully used Earth’s gravity on Friday to slingshot itself on a path toward the asteroid Bennu, for a rendezvous next August. At 12:52 p.m. EDT on Sept. 22, the OSIRIS-REx (Origins, Spectral Interpretation, Resource Identification, and Security – Regolith Explorer) spacecraft came within 10,711 miles (17,237 km) of Antarctica, just south of Cape Horn, Chile, before following a route north over the Pacific Ocean. OSIRIS-REx is NASA's mission to explore near-earth asteroid Bennu, collect a sample, and return it to Earth. To get to Bennu, however, OSIRIS-REx must first leave the plane of Earth's orbit and match the orbital tilt of its target. On September 22, 2017, OSIRIS-REx approached Earth and flew over its southern hemisphere, passing within 11,000 miles of Antarctica. Pretty well done video explanation, imo. OSIRIS-REx launched from Cape Canaveral Air Force Station in Florida on Sept. 8, 2016, on an Atlas V 411 rocket. Although the rocket provided the spacecraft with the all the momentum required to propel it forward to Bennu, OSIRIS-REx needed an extra boost from the Earth’s gravity to change its orbital plane. Bennu’s orbit around the Sun is tilted six degrees from Earth’s orbit, and this maneuver changed the spacecraft’s direction to put it on the path toward Bennu. As a result of the flyby, the velocity change to the spacecraft was 8,451 miles per hour (3.778 kilometers per second). The mission team also is using OSIRIS-REx’s Earth flyby as an opportunity to test and calibrate the spacecraft’s instrument suite. Approximately four hours after the point of closest approach, and on three subsequent days over the next two weeks, the spacecraft’s instruments will be turned on to scan Earth and the Moon. These data will be used to calibrate the spacecraft’s science instruments in preparation for OSIRIS-REx’s arrival at Bennu in late 2018. The OSIRIS-REx spacecraft is currently on a seven-year journey to rendezvous with, study, and return a sample of Bennu to Earth. This sample of a primitive asteroid will help scientists understand the formation of our solar system more than 4.5 billion years ago. NASA’s Goddard Space Flight Center provides overall mission management, systems engineering and the safety and mission assurance for OSIRIS-REx. Dante Lauretta of the University of Arizona, Tucson, is the principal investigator, and the University of Arizona also leads the science team and the mission’s science observation planning and data processing. Lockheed Martin Space Systems in Denver built the spacecraft and is providing flight operations. Goddard and KinetX Aerospace are responsible for navigating the OSIRIS-REx spacecraft. OSIRIS-REx is the third mission in NASA’s New Frontiers Program. NASA’s Marshall Space Flight Center in Huntsville, Alabama, manages the agency’s New Frontiers Program for the Science Mission Directorate in Washington. 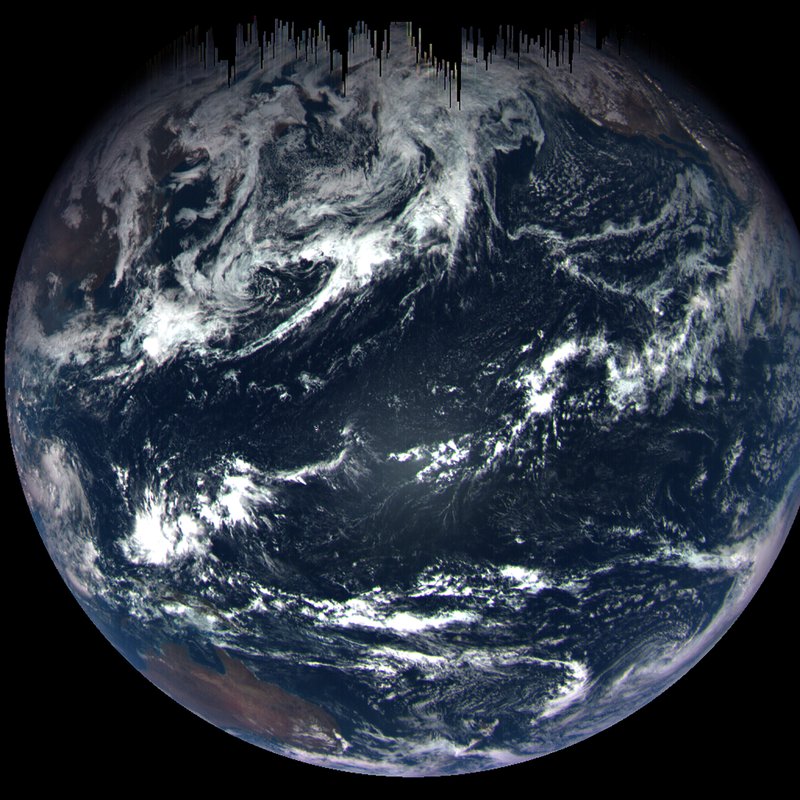 A color composite image of Earth taken on Sept. 22 by the MapCam camera on NASA’s OSIRIS-REx spacecraft. This image was taken just hours after the spacecraft completed its Earth Gravity Assist at a range of approximately 106,000 miles (170,000 kilometers). MapCam is part of the OSIRIS-REx Camera Suite (OCAMS) operated by the University of Arizona. Visible in this image are the Pacific Ocean and several familiar landmasses, including Australia in the lower left, and Baja California and the southwestern United States in the upper right. The dark vertical streaks at the top of the image are caused by short exposure times (less than three milliseconds). Short exposure times are required for imaging an object as bright as Earth, but are not anticipated for an object as dark as the asteroid Bennu, which the camera was designed to image. OK, who wants to go gold mining? This illustration shows the hot, dense, expanding cloud of debris stripped from two neutron stars just before they collided. 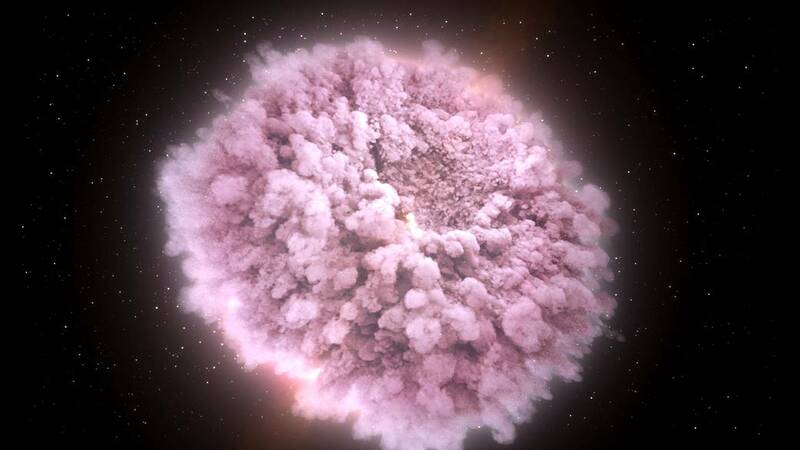 Within this neutron-rich debris, large quantities of some of the universe's heaviest elements were forged, including hundreds of Earth masses of gold and platinum. This represents the first time scientists detected light tied to a gravitational-wave event, thanks to two merging neutron stars in the galaxy NGC 4993, located about 130 million light-years from Earth in the constellation Hydra. Learn more about this phenomenon https://www.nasa.gov/press-release/nasa-missions-catch-first-light-from-a-gravitational-wave-event. No crazy space photos, but I thought I'd share. Did a little road trip over the summer. Couple stops along the way to do some exploring. 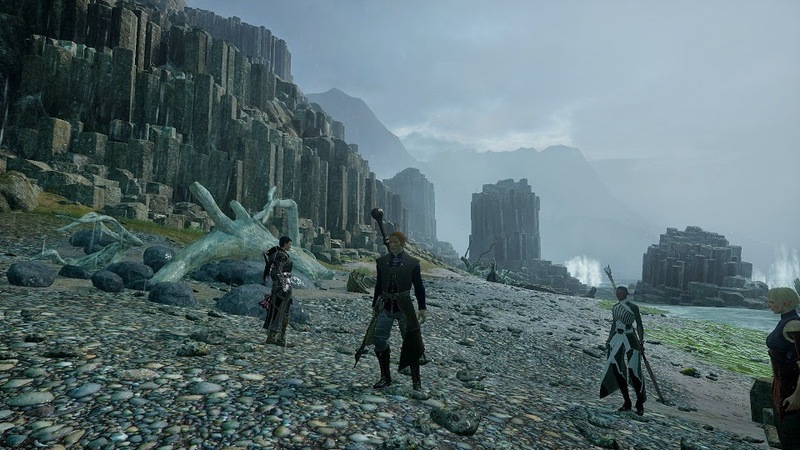 This was one of the places I wanted to see. The Eternal Flame Falls near Buffalo. Some of the reviews I read said the falls may not be that good during the summer, because it's mostly fed with melted snow / spring rain. As we headed in that direction, we were greeted with an hour of some of the worst rain I had ever driven through. All of a sudden, that wasn't going to be a problem. We get there and start the hike. Wasn't too bad, until we got to the bottom, near the stream that leads to the falls. That's when the skies opened up again. All of a sudden, the little tiny stream you could could easily walk through without worrying about your feet getting wet took up the whole "gulch" making it impossible to be able to step anywhere the water wasn't higher than boot level. What's with the light behind the falls? Buc2 wrote: What's with the light behind the falls? It's a natural gas leak. Will pretty much stay lit all the time, but will sometimes go out due to wind or whatever. They recommend bringing a lighter with you just in case it's out when you get there so you can re-light it. As bad as the weather was when we got there, it showed no signs of possibly going out. While I'm here, figured I may as well share a few recent photos I took. This was the view right outside my office during a late afternoon about 2 weeks ago (Oct. 9th to be exact). The fountain is in the James River. This one is a pic I took from the "Bluff Walk" in downtown Lynchburg earlier this summer just before a rain storm arrived. The mountains in the distance are part of the Blue Ridge chain. This was taken near Peaks of Otter in the Blue Ridge Mountains (along the Blue Ridge Parkway). The lake is named, Abbott Lake (aka Peaks of Otter Lake). NYBF wrote: No crazy space photos, but I thought I'd share. Buc2 wrote: This one is a pic I took from the "Bluff Walk" in downtown Lynchburg earlier this summer just before a rain storm arrived. The mountains in the distance are part of the Blue Ridge chain. Is that an up/down, or left/right kink in that span, about halfway across? Surprising either way, considering no supporting structure. Suspect up/down is more likely, as the stresses imposed by a left/right kink would be much more dramatic. It's up/down. Damned if I'd cross it. Fortunately for the residents of that building, there is another exit out the front on the ground floor. This image, captured by the NASA/ESA Hubble Space Telescope, shows what happens when two galaxies become one. The twisted cosmic knot seen here is NGC 2623 — or Arp 243 — and is located about 250 million light-years away in the constellation of Cancer (The Crab). NGC 2623 gained its unusual and distinctive shape as the result of a major collision and subsequent merger between two separate galaxies. This violent encounter caused clouds of gas within the two galaxies to become compressed and stirred up, in turn triggering a sharp spike of star formation. This active star formation is marked by speckled patches of bright blue; these can be seen clustered both in the center and along the trails of dust and gas forming NGC 2623’s sweeping curves (known as tidal tails). These tails extend for roughly 50 000 light-years from end to end. Many young, hot, newborn stars form in bright stellar clusters — at least 170 such clusters are known to exist within NGC 2623. NGC 2623 is in a late stage of merging. It is thought that the Milky Way will eventually resemble NGC 2623 when it collides with our neighboring galaxy, the Andromeda Galaxy, in 4 billion years’ time. Lookit all dem galaxy thingamabobs. Our problems are soooooo small. This NASA/ESA Hubble Space Telescope image is chock-full of galaxies. Each glowing speck is a different galaxy, except the bright flash in the middle of the image which is actually a star lying within our own galaxy that just happened to be in the way. At the center of the image lies something especially interesting, the center of the massive galaxy cluster called WHL J24.3324-8.477, including the brightest galaxy of the cluster. The Universe contains structures on various scales — planets collect around stars, stars collect into galaxies, galaxies collect into groups, and galaxy groups collect into clusters. Galaxy clusters contain hundreds to thousands of galaxies bound together by gravity. Dark matter and dark energy play key roles in the formation and evolution of these clusters, so studying massive galaxy clusters can help scientists to unravel the mysteries of these elusive phenomena. This infrared image was taken by Hubble’s Advanced Camera for Surveys and Wide-Field Camera 3 as part of an observing program called RELICS (Reionization Lensing Cluster Survey). RELICS imaged 41 massive galaxy clusters with the aim of finding the brightest distant galaxies for the forthcoming NASA/ESA/CSA James Webb Space Telescope to study. Such research will tell us more about our cosmic origins. The one on the bottom left looks like pinwheel fireworks. Ice can be stunningly beautiful and also quite varied in its appearance. The most obvious differences are between the two main ice types: land ice and sea ice. But even sea ice can vary dramatically from one place to another. 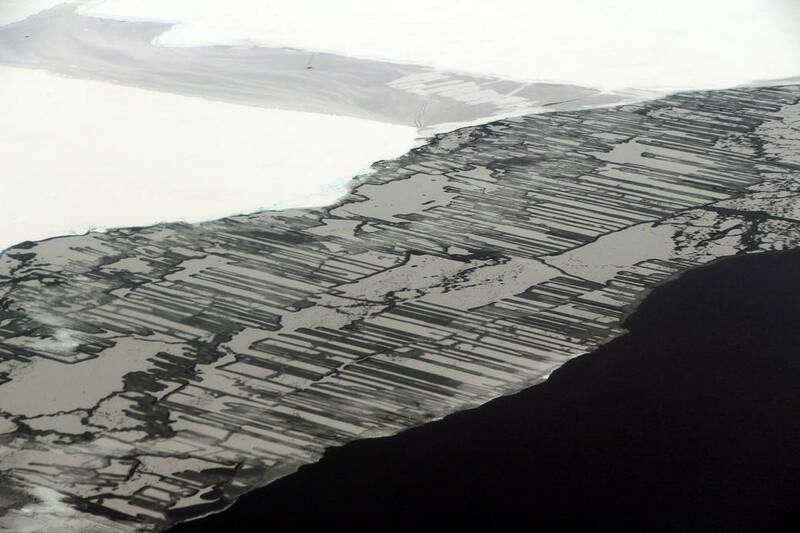 On November 14, Operation IceBridge scientist John Sonntag took this photograph of ice in the Weddell Sea, a part of the Southern Ocean off the Antarctic Peninsula. The mission of Operation IceBridge is to collect data on changing polar ice https://www.nasa.gov/feature/goddard/2017/icebridge-launches-two-sets-of-antarctic-flights and maintain continuity of measurements between ICESat missions. The original ICESat mission launched in 2003 and ended in 2009, and its successor, ICESat-2, is scheduled for launch in late 2018. Operation IceBridge began in 2009 and is currently planned to continue until 2020 so it to overlaps with ICESat-2 to help scientists connect measurements from the two satellites. 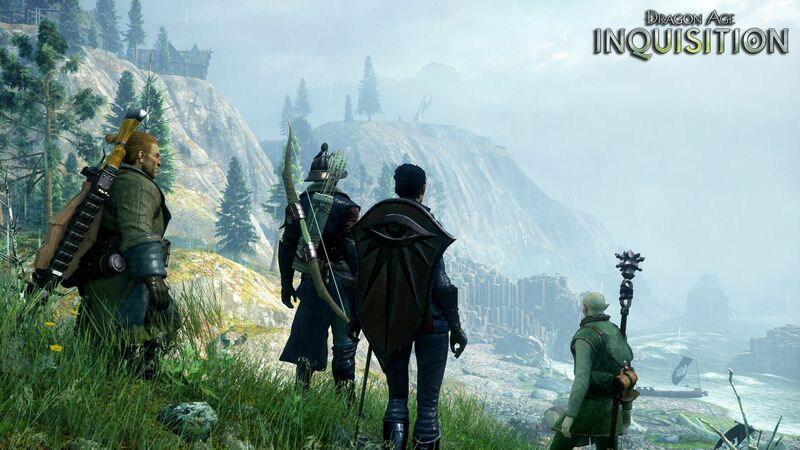 They have a scene very similar to this in one the Dragon Age: Inquisition video game I played. It's hard to tell from this screenshot, but if I could have panned it around to the right, moved the camera up and zoomed out some, it was almost exact.